With more than 80 percent of the monies paid out, Government is targeting a December 2018 completion date for the entire project. With car rentals, new duty free shops, elevators, escalators and aircraft bridges, officials yesterday disclosed that they were forced to redesign the project over the last two years just to make the US$150M do. The project was signed in November 2011 and was set to be completed in September 2015. 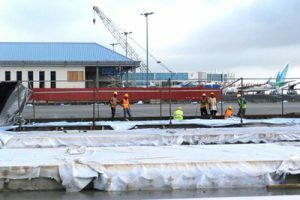 According to Chief Executive Officer (CEO) of the Cheddi Jagan International Airport (CJIA), Ramesh Ghir, the entire project, inclusive of rehabilitation and renovation of existing structures, will be completed at the end of the new year. The CEO was yesterday presenting an update on the project, at the Ministry of Public Infrastructure’s year-end Press Conference. The project encompasses and caters for a new arrival terminal building, upgrades to the existing terminal building, a remote apron, extensions to the north-eastern and south-western runways, a diesel generator room and a fire pump station. “The north-eastern extension of the runway is going to be completed by July 2018, the south-western extension, the first 500 metres of the pavement will be done by April 2018 and then the last 190 metres is going to go until December 2018,” Ghir stated. Meanwhile, these facilities will house baggage carousels and additional duty-free shops in the terminals along with escalators. 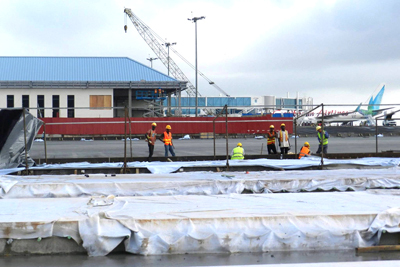 Upon completion, the CJIA is expected to be a modern state-of-the-art port facility, encouraging the smooth flow of services to those arriving in or departing Guyana by air. The China Harbour Engineering Company Limited is the contracted agency executing the project. According to Ghir, persons who traversed through the airport have responded positively to the expansion, despite some of the “hiccups” and “inconveniences” that may be encountered from time to time.